Hans Urs von Balthasar was a Swiss theologian and priest who was nominated to be a cardinal of the Catholic Church. He is considered one of the most important theologians of the 20th century. Born in Lucerne, Switzerland on 12 August 1905, he attended Stella Matutina (Jesuit school) in Feldkirch, Austria. He studied in Vienna, Berlin and Zurich, gaining a doctorate in German literature. He joined the Jesuits in 1929, and was ordained in 1936. He worked in Basel as a student chaplain. In 1950 he left the Jesuit order, feeling that God had called him to found a Secular Institute, a lay form of consecrated life that sought to work for the sanctification of the world especially from within. He joined the diocese of Chur. From the low point of be Hans Urs von Balthasar was a Swiss theologian and priest who was nominated to be a cardinal of the Catholic Church. He is considered one of the most important theologians of the 20th century. Born in Lucerne, Switzerland on 12 August 1905, he attended Stella Matutina (Jesuit school) in Feldkirch, Austria. He studied in Vienna, Berlin and Zurich, gaining a doctorate in German literature. He joined the Jesuits in 1929, and was ordained in 1936. He worked in Basel as a student chaplain. In 1950 he left the Jesuit order, feeling that God had called him to found a Secular Institute, a lay form of consecrated life that sought to work for the sanctification of the world especially from within. He joined the diocese of Chur. From the low point of being banned from teaching, his reputation eventually rose to the extent that John Paul II asked him to be a cardinal in 1988. However he died in his home in Basel on 26 June 1988, two days before the ceremony. Balthasar was interred in the Hofkirche cemetery in Lucern. Along with Karl Rahner and Bernard Lonergan, Balthasar sought to offer an intellectual, faithful response to Western modernism. 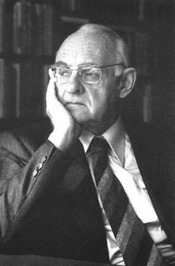 While Rahner offered a progressive, accommodating position on modernity and Lonergan worked out a philosophy of history that sought to critically appropriate modernity, Balthasar resisted the reductionism and human focus of modernity, wanting Christianity to challenge modern sensibilities.